As the beach resorts of Cabo San Lucas, Puerto Vallarta and Cancun become packed with tourists over the summer months, Mexico City is a tempting destination for travelers wanting an authentic trip south of the border that is not filled with raucous bachelor parties. For today’s Destination of the Week, TPG contributor Kristine Hansen takes us on a tour of Mexico’s capital to discover its vibrant neighborhoods, cultural history and colorful art scene. We’re headed to Mexico City. 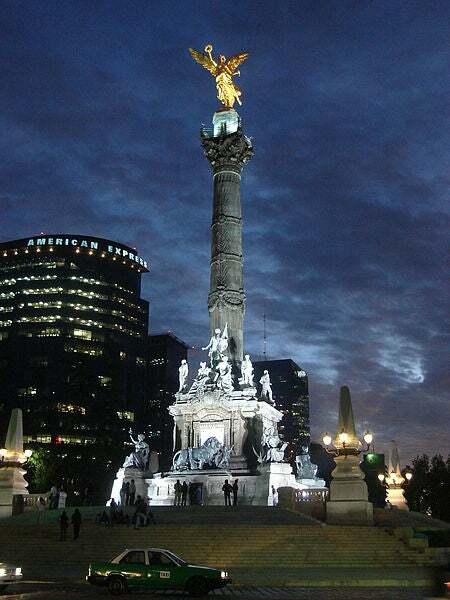 The Angel Monumento al a Independencia was built to celebrate Mexico’s independence centennial. Mexico City is both posh and practical all at once. Many of the country’s wealthiest residents may make their home here, and there is an energetic nightlife scene, but there are also plenty of attractions for all types of travelers, from families to honeymooners, all with an eye on spotlighting Mexico’s myriad culture among its 31 states. From Aztec ruins to Frida Kahlo’s brilliantly hued self portraits, Mexico’s capital city is on the cusp of reinventing itself by showcasing its cultural past. There is even an authentic temescal (sweat lodge) at the W Mexico City, in the Polanco neighborhood (see below). For lovers of art and architecture – not to mention vibrant, walkable neighborhoods like Condesa and Polanco – Mexico City is an ideal destination even if you only have two or three days. Unfortunately, the country’s capital and largest city does live up to its reputation of being clogged with traffic and so you will want to not only budget your time wisely to account for possible transportation snags but also map out your itinerary, even if it means hotel-hopping during your stay. 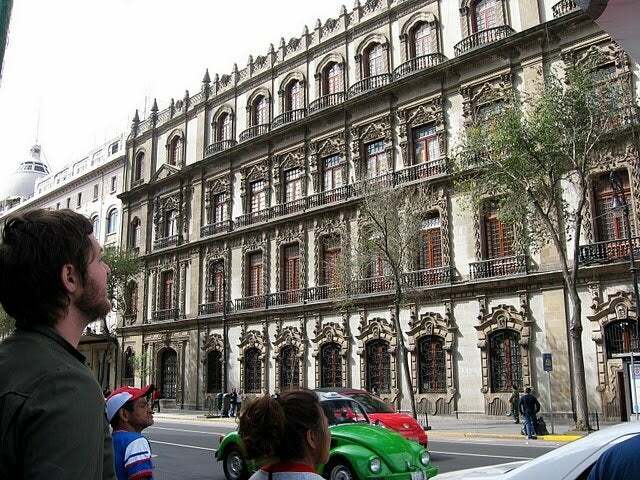 Mexico City is extremely walkable and gives you the chance to take in the historical architecture. Another appealing option is to consider trying out the city’s subway system, Mexico City Metro, which transports 8 million users on 11 lines daily and operates 365 days a year. If you’re in town on business, chances are your meetings are in the Santa Fe (home to many Fortune 500 companies) or Polanco districts as both areas have opened new luxury hotels in the past two to three years. When visiting the city on a Sunday, definitely drop by Paseo de la Reforma, a tree-lined avenue closed to car traffic all day long and beckoning locals to walk their dogs, hop on a bicycle or take a stroll. Begin at the famous Diana Fountain, in front of St. Regis Mexico City. 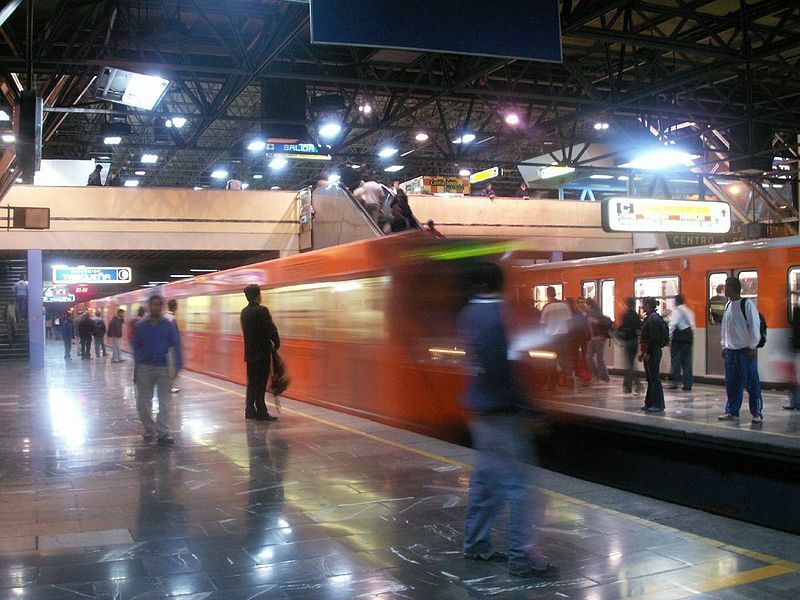 The Mexico City Metro system is a cheap and convenient way to get around the city. Another weekend must-do is the Saturday craft market and bazaar in the San Angel neighborhood, which occupies an entire park (San Jacinto Plaza) and features high-end paintings, jewelry, home décor and leather goods (such as purses, wallets and sandals). Be sure to arrive shortly after the market opens at 9 a.m. for the best selection. Plus, you’ll want to wander around the cobble-stoned streets and pop into a little café for authentic local lunch. Museo Frida Kahlo (also called “La Casa Azul”) is the former home of surrealist artist Frida Kahlo, who married Diego Rivera in 1929, and moved into the pretty blue house with him that same year. Today the house in Coyoacan functions as a museum in Frida’s honor, with the couple’s distinctive artwork hung on the walls. 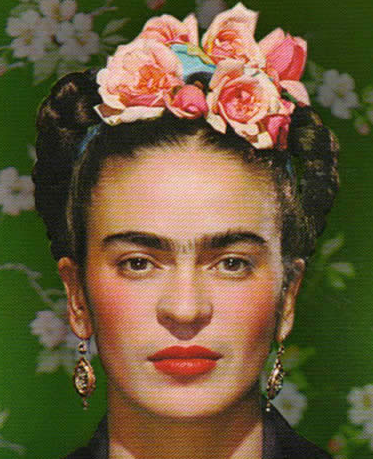 The Museo Frida Kahlo is located in the former home of the surrealist artist. The Museo Nacional de Anthropologia holds the title of Mexico’s most-visited museum (about 2 million people each year) and no wonder: extremely significant relics like a 16th Century Aztec statue of Xochipilli and an Aztec calendar stone call it their home. Plan to spend a half-day here, or at least two to three hours, as the richness in this collection runs very deep. 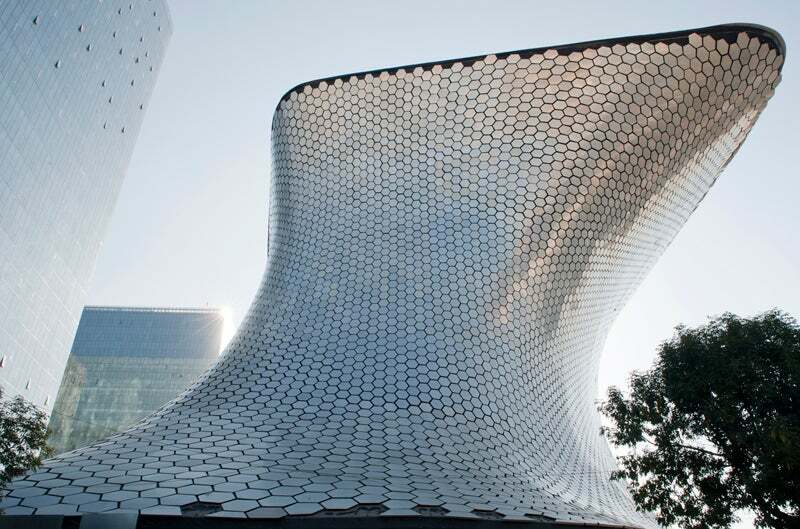 End your day of sightseeing at the second location of Museo Soumaya in the Polanco neighborhood, which opened in 2011. The first is in Mexico City’s San Angel neighborhood, and both house financier Carlos Slim’s well-heeled art collection, which includes 66,000 individual pieces. The soaring structure of the Soumaya Museum is as impressive as the art inside. The soaring, curvy structure itself is worth some pause as you’re walking from floor to floor. Designed by Mexican architect Fernando Romero (with engineering assistance from Frank Gehry), it’s heavily influenced by the sculpture artist Auguste Rodin. The museum also showcases 380 of his casts, the largest number outside of France. After art-gazing, be sure to kick back with a glass of wine at Carolo Carso, on the top floor of the adjacent luxury shopping center. The wine list boasts 250 selections and most of the dishes are crafted with organic, locally-grown spices, rich flavors and fresh herbs for the ultimate in bistro fare. Mexico City’s highest-end and eclectic dining experiences are tucked into the city’s two most upmarket neighborhoods: Polanco and Condesa. Distrito Federal also hosts fine eateries. It’s well worth springing for a glass of Mexican wine at these places because bottles from the country’s up-and-coming regions aren’t currently exported to the States. Varietals performing quite well are Chardonnay, Sauvignon Blanc, Cabernet Sauvignon and Syrah. Dulce Patria is a hotspot even for locals. Located in the Polanco neighborhood, it is inside the indie boutique hotel, Las Alcobas. Expect nothing short of whimsy – including mini Mexican flags, baby roses and party favors poking out of your exquisitely prepared meal – but also put on your finest clothes as this is where all the beautiful people dine on Mexican-inspired dishes like ceviche and empanadas. About 400 selections of wine are available for sipping, from bottles sourced from Baja, Mexico, to those from France, Chile, California and even Israel. Restaurante Izote, also in the Polanco neighborhood, has a casual ambiance yet the service, presentation and quality of cuisine is much more elevated. Owned by chef and celebrated cookbook author Patricia Quintana, it’s a culinary tour of Mexico illustrated through small plates that hone in on regional ingredients like pumpkin seeds and Oaxacan mole sauce. Continuing the theme, many of the restaurant’s wines hail from Mexico, along with regions like Argentina for fabulous food pairings. Open only since last May, Jean-Georges Vongerichten’s culinary stamp on Mexico lies within St. Regis Mexico City. At J&G Grill are a whopping 2,000 bottles of wine to pair with dishes like roasted Yucatan grouper and its “aromatic” black beans. If dining solo, grab a seat at the curved bar overlooking the Diana Fountain along Paseo de la Reforma. Street tacos from a local stand are a must for any visitor to Mexico City. 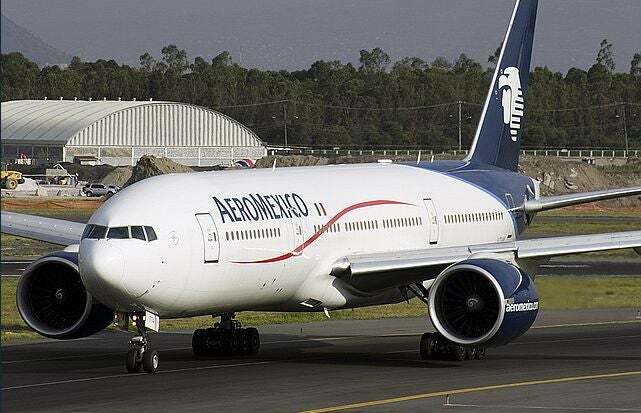 Aeromexico is one of the major airlines flying into Benito Juarez International Airport (MEX). Mexico City’s international airport – Benito Juarez International Airport (MEX) – is located eight miles east from the city center. Most major airlines service the airport, including American Airlines, AeroMexico, Delta Air Lines, United Airlines, AirTran and US Airways, and service major hubs in the United States including Phoenix, Dallas/Ft. Worth, Atlanta, Chicago, JFK in New York City and Miami. It’s considered to be Latin America’s second-busiest airport (after Sao Paolo, Brazil) and therefore lines through security are often long so be sure to allow for extra time. Once you land at the airport, it’s easy to hop on Mexico City Metro, via Terminal 1; if you’re arriving at the airport on the subway system, look for Terminal Aerea. Otherwise, taxis are plentiful (one-way fare is between 200 and 250 pesos, or $15 to $20). Most taxi drivers speak English very well. Radisson Hotel Flamingos: While not overly flashy, this unique 252-room hotel is centrally located within walking distance to attractions like Frida Kahlo’s home, the World Trade Center (just one mile away) and the Museo Nacional de Anthropologia. WiFi is complimentary, as are Jacuzzi/sauna, and movie rentals. On the Business Class Floor, a complimentary continental breakfast buffet is served daily and free non-alcoholic beverages are available all day. At the on-site Passerina, a mix of Mexican and internationally inspired dishes are served three times a day, and the nightclub Scala hosts musicians and DJs from around the world in a cabaret-style setting. Rates in June start at $85 per night. This is a Category 2 property requiring 15,000 Gold Points per night. 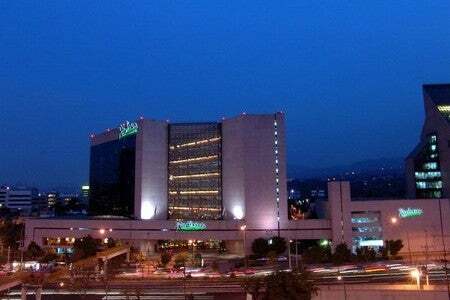 Radisson Paraiso Hotel Mexico City: This 237-room hotel has a fitness center and four casual restaurants, but there is a fee for WiFi use. Room rates start at $130 per night or 28,000 Gold Points in June. Hilton Mexico City Reforma: This sophisticated 458-room hotel in the heart of Mexico City’s historic downtown area has a 25-meter rooftop pool, spa, fitness center, three restaurants and art from acclaimed Mexico artists throughout. Each of rooms has a Herman Miller ergonomic desk chair, flat-screen TV and high-speed Internet access (for a fee or complimentary for suite guests). Room rates start at $129 per night in June. This is a Category 4 property and requires 30,000 Hilton HHonors points for a free night redemption (20,000-30,000 seasonally). Other Hilton options are the Hampton Inn & Suites Mexico City–Centro Historico, with a six-story glass atrium, stained-glass windows, free breakfast and WiFi, and a short walk to historical attractions; plus near the airport: Hilton Mexico City Airport, within Terminal 1; and DoubleTree by Hilton Hotel Mexico City Airport Area. Hyatt Regency Mexico City: The 755 luxurious rooms at this Hyatt property have marble baths, and suites overlook Chapultepec Park and Lincoln Park. WiFi is free. 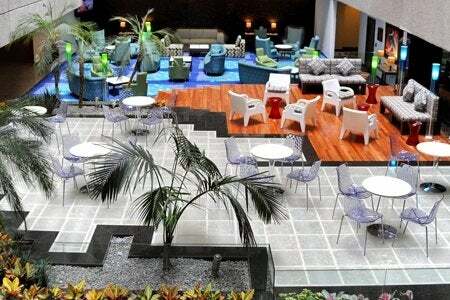 It is located in the Polanco neighborhood near fashionable boutiques and restaurants. Regency Club perks include private check-in and check-out plus food and beverage all day at Regency Club Lounge. 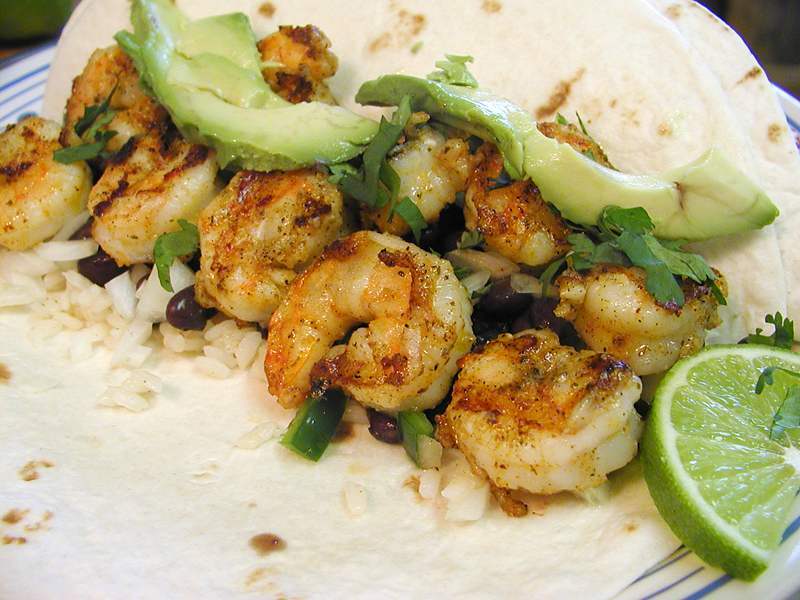 Restaurant offerings include the Teppan Grill with cooking demos tableside, and El Jardin’s famous Sunday brunch. Rooms in June start at $230 per night or 15,000 Hyatt Gold Passport Points since this is a Category 4 property. 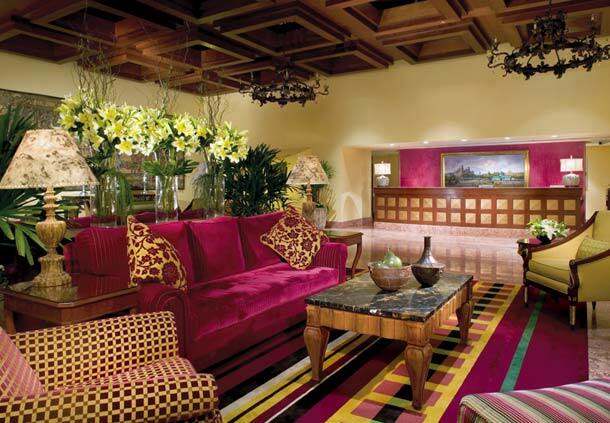 The classic red and gold lobby decor of the JW Marriott Hotel Mexico City. JW Marriott Hotel Mexico City: The 26-story high-rise in the Polanco neighborhood has 312 rooms and six suites decorated in a classic red and gold theme with marble baths and WiFi for a small fee. Three eateries on-site offer French-brasserie and Latin-infused flavors and a chic coffee-house vibe. Rooms rates start at $459 per night in June. This is a Category 5 property requiring 25,000 Marriott points per night. Courtyard Marriott Mexico City Airport: Located inside Terminal 1 of the airport, the 288-room stylish and modern hotel has a fully equipped fitness center, free WiFi, and a complimentary shuttle service to and from the airport. This is a Category 3 property requiring 15,000 Marriott points per night. The palatial Motor Lobby at the Presidente InterContinental Mexico City. 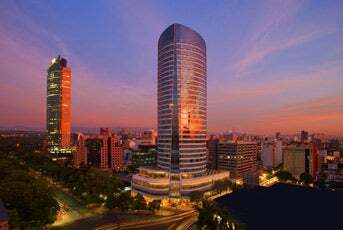 Presidente InterContinental Mexico City: This hotel has 661 rooms including 33 suites in the Polanco neighborhood with Au Pied de Cochon’s 24-hour dining service (a replica of the famed Paris bistro of the same name) plus a full-service spa. There is a fee for WiFi. Rooms rates start at $299 per night in June or 30,000 Priority Club points. Porsches parked in front of the luxurious Presidente InterContinental Santa Fe. Presidente InterContinental Santa Fe: Within a 27-story tower that is Santa Fe’s tallest building offering sweeping views of the Valley of Mexico and near Latin America’s largest shopping center (Centro Comercial Santa Fe) are 111 guest rooms including 39 suites at this perennially popular hotel. Rooms rates start at $197 per night or 25,000 Priority Club points per night June. Crowne Plaza-Hotel de Mexico City: This boutique style hotel is convenient to the airport and the World Trade Center, each of the 310 rooms have both free WiFi and usage of a computer. Massages can be scheduled in the hotel’s pared-down spa. Room rates start at $159 per night in June or 20,000 Priority Club points per night June. In addition, a dozen Holiday Inns are currently available, and in mid-August Holiday Inn-Mexico City Buenavista Insurgentes opens, bringing another new hotel to the downtown area. Sunset at The St. Regis Mexico City in the heart of downtown. The St. Regis Mexico City: This five-star hotel has 152 spacious rooms plus suites ranging up to a two-bedroom apartment with butler service, offering views of the city skyline along with high-thread count linens and marble baths stocked with Remede toiletries. Guests are greeted with a flute of sparkling wine upon arrival, dining options include a high class breakfast and the elegant Diana Restaurant (named for the famous Diana Fountain out front, along Paseo de la Reforma). The fitness center features the Remede Spa, which is among the city’s best. Rooms rates start at $475 per night in June. This is a SPG Category 5 property requiring 12,000-16,000 SPG points per night. 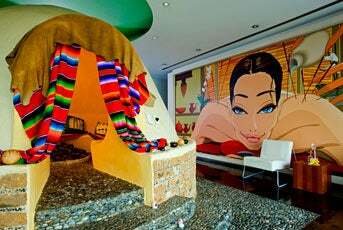 W Mexico City: This 237-room hotel in Polanco reflects the trendy neighborhood along with Frida Kahlo and Diego Rivera-inspired designs. Featured in the spa is an authentic tesmescal sweat lodge, and Bliss products are available in each room. Rooms rates start at $349 per night in June. This is a SPG Category 5 property requiring 12,000-16,000 SPG points per night. Westin Santa Fe: This three-year-old 259-room hotel is close to meeting locations in Santa Fe and features a rooftop lounge serving breakfast each morning (also on the rooftop is a full-service spa). Adjacent to the hotel is a small upscale shopping center with clothing boutiques, a chocolatier and a Starbucks. Rooms rates start at $220 per night in June. This is a SPG Category 4 property requiring 10,o00 SPG points per night. 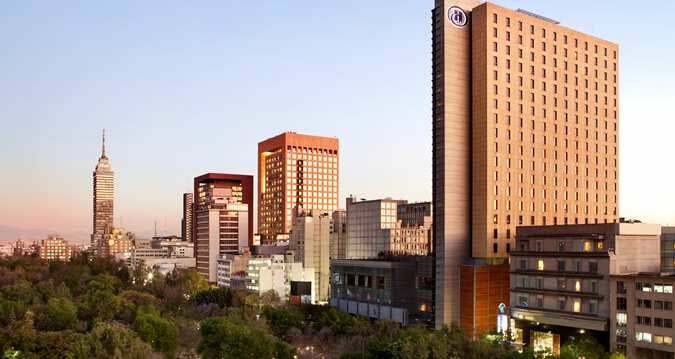 Sheraton Maria Isabel: Located on on Paseo de la Reforma, this property features 755 guest rooms and suites. There is also a Sheraton Club Lounge for club level guests and SPG Platinum members that serves complimentary breakfast, afternoon hors d’oeuvres and a variety of beverage options. Rooms rates start at $110 per night in June. This is a SPG Category 4 property requiring 10,o00 SPG points per night. 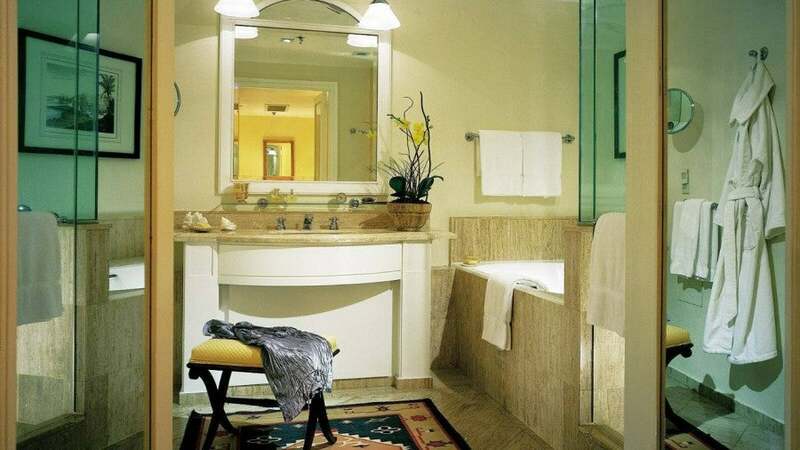 The 250 rooms at the The Four Seasons Hotel Mexico Distrito Federal boast deep soaking tubs. The Four Seasons Hotel Mexico Distrito Federal: This hotel has 240 rooms each with a deep soaking tub, marble bathroom, flat-screen television, WiFi, and lavish décor. The sophisticated property located on the Paseo de la Reforma features relaxed spaces such as a landscaped fountain courtyard, and Reforma 500 restaurant serving Latin American cuisine with contemporary flair. Room rates start at $460 per night in June. The St. Regis Mexico City is also part of the Amex Fine Hotels & Resorts program. Live Agua Basques Mexico City serves an impressive selection of 300 whiskies, tequilas, mezcals and wines. Live Agua Basques Mexico City: This hotel located in the Polanco neighborhood has 112 rooms and 23 suites that feature a Nespresso coffeemaker, 46-inch television (plus another television in the bathroom) and an aromatherapy kit. At Live Agua, the hotel’s restaurant, there is a staggering display of 300 whiskies, tequilas, mezcals and wines. Room rates start at $341 per night in June. The traditional exterior of the 17-room boutique Hotel Brick. Other properties include Hotel Brick which is a 17-room boutique hotel in the La Roma neighborhood has eye-catching architecture four eating spots, and Las Alcobas, a small 35-room property in the Polanco neighborhood hosting Dulce Patria for fine, eclectic dining. Hyatt Regency Mexico City and The St. Regis Mexico City are also Visa Signature hotels.